With increased services now available on the Internet, from ordering photo reprints to shopping on-line, Jen-Ai Hospital: Tali unveiled its "Baby Web Nursery" to help parents provide a picture of their newborn baby to friends and families all around the world. This free service was created by Jen-Ai Hospital: Tali, at the request of the parents who wanted their friends and families that were unable to come in person, to see the baby on the web. After the baby is born, the webpage with basic information and picture of the baby is uploaded within 72 hours to be shown to the general public. "Similar services are offered in some of the hospitals in the United States, but none of the major hospitals in Taiwan has yet to provide this kind of service," says Mark K. Chan, Project Manager of Jen-Ai Hospital: Tali. "It is about time that this service should be presented to all mothers-to-be who have friends and families, outside the city or outside Taiwan," adds Chan. 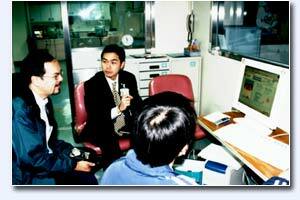 In addition, Jen-Ai Hospital: Tali is in the process of creating "International Patient Center" to accommodate the growing medical needs of the foreign communities in Taiwan and is tentatively scheduled to open during the summer of 2003. Jen-Ai Hospital is a not-for-profit organization with two separate branches located in Taichung, the central part of Taiwan. Jen-Ai Hospital: Tali is a 746-bed, tertiary care community hospital; while Jen-Ai Hospital: Taichung is a 146-bed, secondary care hospital. Jen-Ai Hospital: Tali is recognized as the biggest regional teaching hospital in the Tali area; whereas, Jen-Ai Hospital: Taichung is known as one of the hospital with a long tradition in Taiwan, located in the middle of Taichung city.